Caption slip reads: "Photographer: Wilson. Date: 05-22. Reporter: McMahon. 109/110: Gal in white hate with sunglasses is Mrs. Alycia Marlyn Hunter, preliminary hearing on grand theft charge. Disregard gal covering her face in background, she has no connections with case - now they tell me! 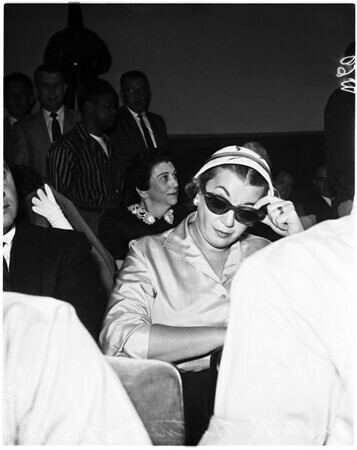 60/61: Close ups of Mrs. A.H. Hunter, seated (sunglasses)".